The Alternative Carriage Company is proud to offer the Trike Hearse as an alternative to a normal hearse. We regard this as the modern equivalent of the horse drawn hearse. It can be used by anyone, not just bikers. If you would like to travel your last mile in style, please let your family know your wishes. the hearse can be booked directly through us, or through your local funeral Director. We would be honoured to accompany you or your loved one on the final ride. 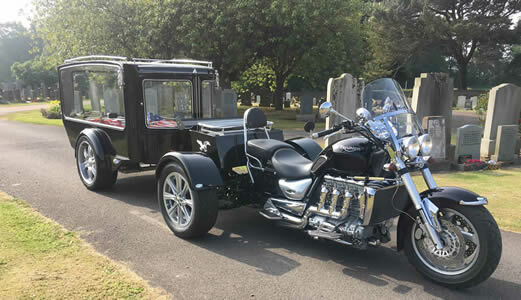 Perhaps the deceased was something of a biker, or you simply want to inject some 'cool' into the funeral service; Motorcycle hearse is available to hire. All you have to do is contact us. The Alternative Carriage Company is pleased to announce that they have now added a Limousine to the fleet. It’s a Cadillac Deville 54” stretch limousine, which can take 6 passengers in the back, with the middle row of seats either facing forwards or to the rear. It can be hired for funerals, weddings or executive/tours. 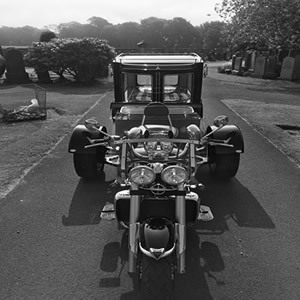 The Motorcyle Trike and Hearse Funeral Service is available to families and funeral directors throughout Scotland.